The Mayan Indians of Guatemala live in the mountain villages of their ancestors, in many ways preserving their ancient culture. 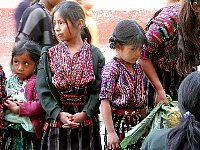 After the Spanish conquerors arrived in the 16th century, many Maya found their way from the large communal centers to the more remote mountains and forests. There they continued to live and work in the old way. The weavers and carvers proficient in design and technique struggled to pass these skills on to their children, and eventually to their descendents. 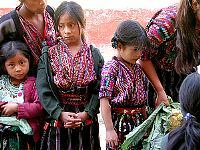 Many Mayan women still weave and wear the traditional costume of their mother's mothers. Men still carve and work cornfields that run right up to the door of their homes. 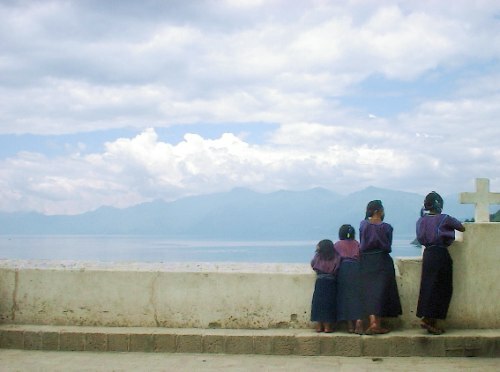 Children run about barefoot, watching the younger children. Working in or near the home is important to the large extended family system that is typically Mayan. Working with Mayan weavers and craftsmen, Maya Jones Imports participates in designing fabrics and objects that will compliment our own designs and life styles. It is impossible to control all the variables in the creation of hand made product. Changes in dyes, threads, and even the weather can alter the finished product whether it be a garment or carving. These beautiful objects, their textures, richly traditional designs and exciting colors are likely some of the finest you will ever see. In spite of the often difficult and changeable political situation in Central America, Maya Jones Imports maintains a number of native Mayan Indians in a stable work environment. This ensures the Mayan craftsmen of fair compensation for their efforts and guarantees our customers the best availability, selection, quality and price. Economic pressures have pushed craftsmen to faster, less difficult work not destined to be used by the Indians themselves. Materials used have changed as, for instance, certain natural dyes and hard woods become scarce. Hand spinning has become too time consuming and acrylic threads are less expensive than traditional cotton, wool and silk. Many young families, frustrated by the lack of opportunity in their rural communities move to large cities and leave behind both traditional costume and roots. This loss of the Mayan cultural base is a loss for us all. Maya Jones imports hopes to share with you our respect for the indigenous people of Guatemala.